Israel's Ministry of Defense released photos of a recent Arrow 3 anti-ballistic missile system test amid rising tensions with Iran. The Ministry of Defense on Tuesday released photographs of recent tests of Israel's "Arrow 3" anti-ballistic missile system. During the tests, a model of the interceptor missile was launched in order to check the propulsion system, as well as other tracking sensors. The Arrow 3 system is an upgrade of the Arrow 2 defense system that has been in development with the United States since the 1980s, designed to intercept long-range missiles. The improved Arrow 3 system is cheaper than its Arrow 2 counterpart. Israel's concept of a multi-layered missile defense system includes the interception of missiles fired from a long-range, as well as those fired from close or medium-range. If the long-range interceptors are unsuccessful, the lower layers of the defense system will be able to intercept as well. The Arrow 3 system is said to have similar capabilities as those interception systems present on U.S. Aegis destroyers, being able to intercept missiles at great altitudes and distances. The timing of the release of the photographs has been taken by analysts to be a message for Iran as international pressure mounts on the Islamic Republic to abandon its drive for nuclear weapons, which Israel says is aimed at the Jewish state's destruction. Iran has called Israel a "one bomb state." "Tehran doesn't have a nuclear program - it has a program for the destruction of Israel," Minister of Public Diplomacy Yuli Edelstein told the World Jewish Congress on Tuesday. "The Iranian regime openly calls for Israel's destruction, is planning the destruction of Israel, and is working daily to destroy Israel. The lesson says should spur the world to action," Netanyahu said during a speech for International Holocaust Remembrance day in the plenum on Tuesday. IDF Chief of Staff Benny Gantz, speaking at a memorial service for the crew of the Dakar Submarine, lost at sea on its way from England to Israel on 9 January 1986, was confident Israel could face down all of its foes. "I suggest that no one tests our determination," Gantz said. 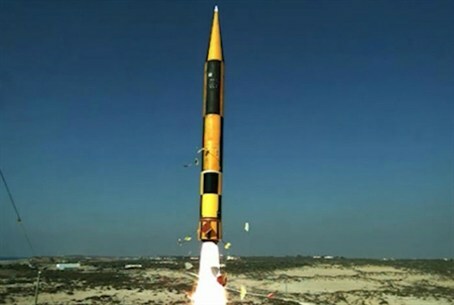 Development of the Arrow 3 system, intended to intercept long-range missiles launched at Israel, including those equipped with non-conventional warheads, will continue until the system is declared operational 2014.